All the slots of the exam are over for the IBPS PO Preliminary Exam 2017 and the reviews of the exams are out in our blog. The entire slots of this day seems to be different and each batch has different sets of question pattern. There was a wide change in the quants section and the english section was really in the difficult range. Check the reviews of the IBPS PO 2017 preliminary examination 2017. We have also updated the number series questions asked in the SLOT 1 of the IBPS PO preliminary examination 2017 in the link below. Solve it and get benefited. You can also give us your valuable feedback on the exam and the number of questions attended and the overall difficulty level of the exam in the poll. This will be of much help to us to chart down the overall marks of the exams. How many Questions have you attempted in IBPS PO Prelims 2017? 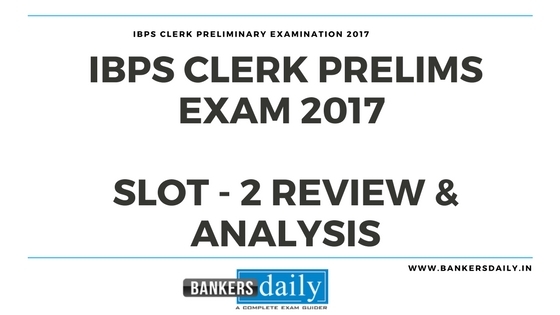 Team Bankersdaily wishes all the aspirants who are attending the IBPS PO Preliminary examination 2017 on 7th October 2017. Please mention your feedback in the below mentioned ways and it will be useful for other who are attending the exams in the forthcoming batches. The questions asked in the exams are getting updated instantly in the blog and if you remember any questions that are asked in the exams, please tip us in the below mentioned ways.This will be definitely useful for the candidates who will be appearing for the exams in the forthcoming days. We are expecting your valuable feedback about IBPS PO Prelims from the aspirants side those who are attending on 4th Slot. Try to attend more than 50 questions in the Exam. The previous year cutoff marks will give you an insight and will give you an idea of the number of questions to attend and also the accuracy level you should maintain in the exams. The overall cutoff marks for various categories in the IBPS PO 2015 preliminary examination. This is the Overall cutoff marks which is obtained for the total 100 marks of the examination. Coding decking is very simple. Simple moderate pattern have to come in this exam. 4 lines of coding r there .and those output r also 4 lines of coding words. I thought same but there is no mistake. thing is fruit repeats. there are only 5 fruits given so there is one mango in bottom row and another one in top row. Many ppl including me thought question was a mistake. But its not.